If you take part, or intend to take part in an endurance sport like cycling, marathon, triathlon or cross country skiing, then you need to pay particular attention to consistently fuelling the body with food and liquids. Replace fluids lost in sweat. If you lose too much fluid and electrolytes (potassium, sodium) through sweating without replacing them you will suffer from dehydration. Sports drinks are a good way to re-hydrate. Take plenty of fluids throughout the day. It's important for the athlete to turn up for a competition or training session hydrated. Start the day off with a sports drink and make sure there is a plentiful supply of water at hand at all times. Use water fountains or water coolers as a trigger for fluid intake. You should hydrate 2-3 hours before competition. Try to take onboard at least 16oz 2 cups of liquid at this time and 10-20 minutes before starting your competition have another 1 cup of liquid at least. It's important you know your sweat rate and how to replace it. Athletes need to know how much they can drink during a competition; this will vary according to the weather and the intensity of the exercise. To know your sweat rate you should measure how much weight (in fluid oz) you lose when competing, plus how much fluid you are consuming; this should equal the amount you need to drink to replace lost fluid. Drink only to replace lost fluids, do not over drink. A lot of inexperienced marathon runners tend to do this, as they run at a slower pace and tend to take on board liquid at every opportunity. This can lead to over hydrating and can become dangerous as sodium levels in the body can drop dangerously low. A pre-race meal should consist of high energy foods like- bread, cereals, pastas, rice, fruit and vegetables and lean sources of protein. Around 65-70% of the food on the athlete's plate should be carbohydrates. 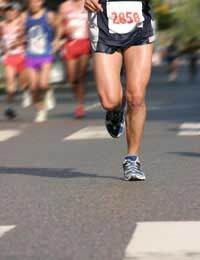 Attention should also be paid to the meal the evening before a race. It's a good time to stock up on easily digested carbohydrates like potatoes, pasta, rice and fruit juices. The sodium the body loses while competing also needs to be replaced. Anyone competing in an endurance sport shouldn't be following a diet that is low in sodium. Sodium can be replaced by salting your food regularly, eating salt based snacks, like pretzels, nuts or soups. After training or racing it's important to take in carbohydrates as soon as your body will allow, this enhances glycogen replacement. Try having on hand a fruit smoothie, chocolate milk drink, banana, or yoghurt. You can of course have meal of pasta, both solids and liquids are equally as good at refuelling the muscles.